Netanyahu at the Jerusalem Day celebrations at the Mercaz Harav Yeshiva: Jerusalem is Israel’s eternity. Prime Minister Binyamin Netanyahu said on Tuesday night that Jerusalem is the heart of Israel and, as such, will never be divided again. 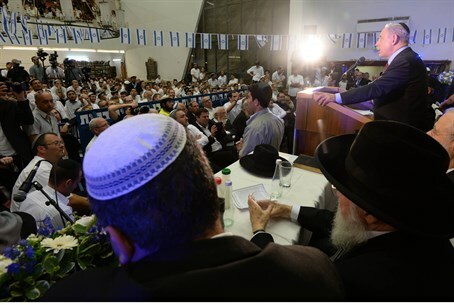 Netanyahu made the comments in a speech he gave at the annual Jerusalem Day celebrations at the Mercaz Harav Yeshiva. The celebration at Mercaz Harav is traditionally attended by the important figures of Religious Zionist rabbinic and political leadership. This year the dais included, among others, Economy Minister and Jewish Home chairman Naftali Bennett, Housing Minister Uri Ariel, Chief Rabbis David Lau and Yitzchak Yosef, Former Chief Rabbi Shlomo Amar, Dep. Minister of Religion Eli ben Dahan and well known rabbis, including Chief Rabbi of Kiryat Arba-Hevron, Rabbi Dov Lior. Jerusalem Mayor Nir Barkat, in his words, mentioned that at the annual Jerusalem Award ceremony he had just attended, three out of the twelve recipients were graduates of Mercaz Harav. "I feel at home in Merkaz Harav Yeshiva", said the Prime Minister, "it seems like home to me, because my grandfather knew Rabbi Kook zts"l well and because I knew Rabbi Avraham Shapira zts"l, father of the present dean, very well and respected him greatly." The yeshiva dean, Rabbi Yaakov Shapira, told the Prime Minister that his insistence on recognition of Israel as a Jewish state is a source of pride, reminding him that Netanyahu's good friend and advisor, Uri Elitzur z"l, was also a Mercaz graduate. "Those who remember Jerusalem immediately after the Six Day War, it was not a small village nor a large city...and today Jerusalem is a huge city,” said Netanyahu. “Jerusalem is Yad Vashem, Jerusalem is Herzl’s burial place and the Mount of Olives, where my grandparents are buried, as is Menachem Begin,” he continued. “And Jerusalem is also Mount Zion and Mount Moriah and the Western Wall, Jerusalem is Israel’s eternity, it is our heart, and we are guarding our heart - the heart of the nation. We will never divide our heart,” declared Netanyahu. "I am here tonight to rejoice with you in the joy of Jerusalem, and I'm here to strengthen your hands for your diligence in the study of Torah," Netanyahu told the many students and rabbis who were present. "I want to congratulate you with a happy holiday for Jerusalem and for the entire people of Israel,” he concluded. This year marks the 47th year since the unification of the 3,000-year-old capital of the Jewish people, which occurred in the 1967 Six Day War and which is celebrated on Jerusalem Day. Also speaking at the Mercaz Harav celebration on Tuesday night was Housing Minister Uri Ariel, who promised that there will be no more construction freezes in Judea, Samaria or Jerusalem. "There will be no more freezes, we will not accept delays and restrictions in Jerusalem, Judea and Samaria, and we will continue to build in all parts of our country," said Ariel. “Jerusalem will not be divided again. Between the Jordan and the sea there will be only one state, and that is the State of Israel,” he declared.